Leonidas: Named after the great king of the Spartans elected to defend Greece from the combined armies of Xerxes at Thermopylae in 481BCE. Or if not that, then the bound of Lacedaemon must mourn a dead king, from Heracles’ line. The might of bulls or lions will not restrain him with opposing strength; for he has the might of Zeus. 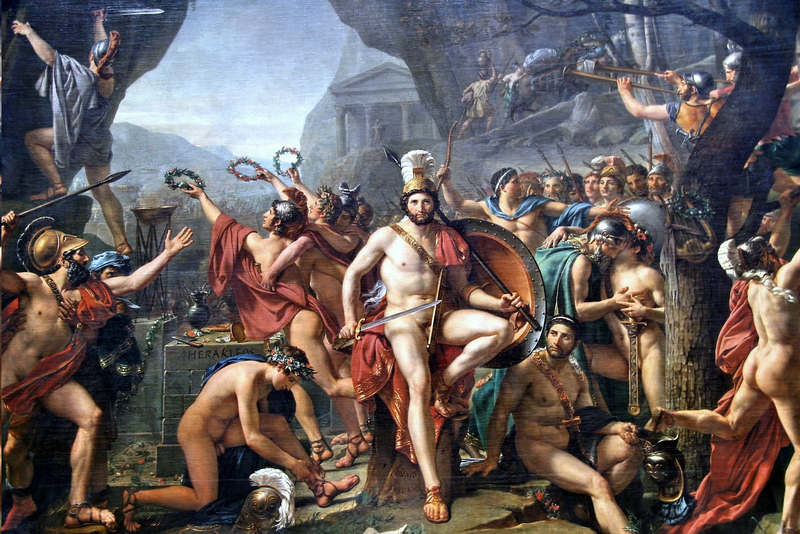 Leonidas’ stand with his 4000-7000 (the 300) troops was the inspiration also for possibly the gayest painting ever made. I’ve seen things you “people”(my quotes) wouldn’t believe. Attack ships on fire off the shoulder of Orion. I watched c-beams glitter in the dark near the Tanhauser Gate. All those moments will be lost in time, like tears in rain. [pause] Time to die. Rutger Hauer’s gentle evocation of the memories, experiences, and passions that drive the short lives of androids mirrors our own transitory connection to time, memory, understanding and what remains. This is even more so for a LEONIDAS, a sentient non-human, because his transit will be so brief, what he leaves so ethereal and what he takes with him, to “people”, unbelievable..
A dog’s life is brief, his feelings, thoughts, if any, are hidden from us mortals. According the Upanishads, horses (and possibly dogs) retain their memory of past lives. History for them may be an unbroken ribbon of tests of love and loyalty. 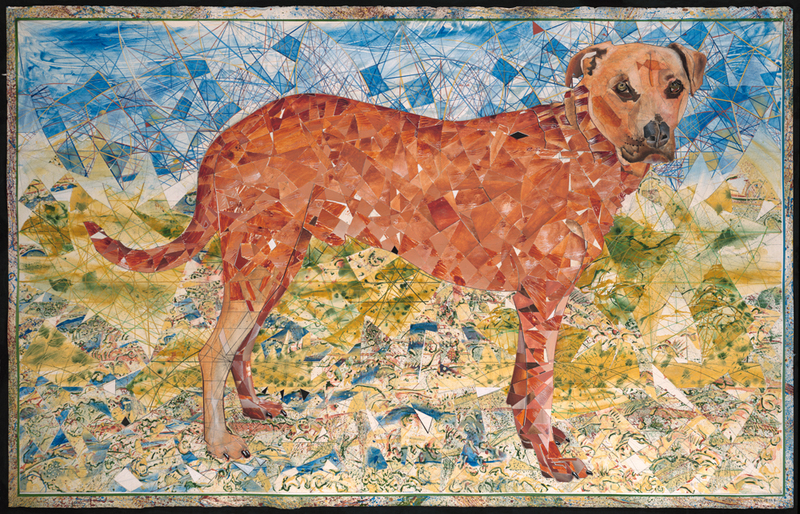 Like the sacrificial horse of the The Brihadaranyaka Upanishad; LEONIDAS allows us to contemplate the trail of experience, memory and loss as the universe contained in the horse (dog) is continuously dismantled and reassembled. 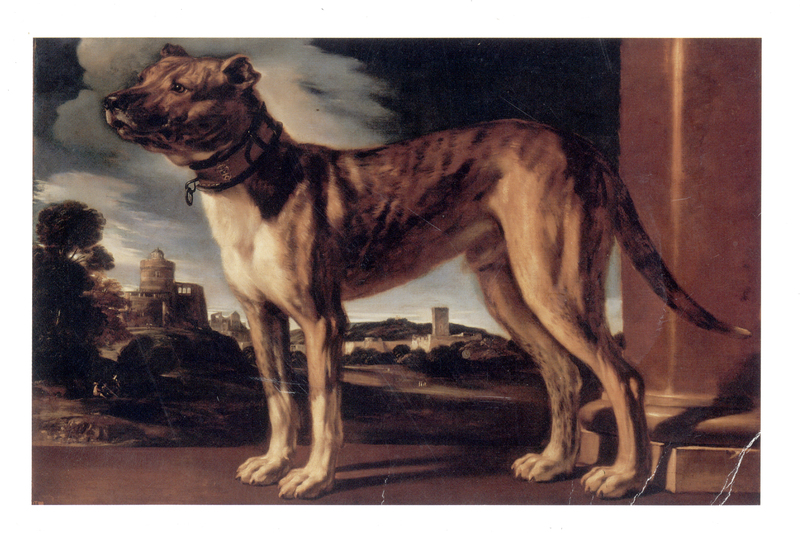 Leonidas is a painting about a dog, not of a dog. It was built on a golden mean (GM) (1.618) grid and using enlarged photographs all the lines were coordinated to major and minor vertexes on the grid. I could have used a raster to vector conversion program and had it printed full size but to align the outlines with the GM Grid would have been inaccurate at best. Doing the conversion by hand enabled the accurate placement of the endpoints of each line and the radius and endpoints of each arc. This enabled the outline to be more fully connected to the structure of the painting. Otherwise it would be merely laid on top of the grid destroying the, figuratively, figure ground relationship. All the lines and shapes in the painting were actual strokes and fills from actual construction of the outline.